For years Ellie Quicke has been at her husband’s beck and call, and now she’s alone and unsure of herself. A greedy daughter and a difficult aunt demand money and attention, while potential suitors are already on the scene. Then a brutal murder takes place in the church opposite. Is this something to do with the warring couple next door? Does the boy down the road know more than he’s saying? The murder victim’s mother goes missing. Ellie’s sure she saw something important that night…but what was it? As Ellie begins to weigh up the strange goings on in the neighbourhood, a personality more astute and capable emerges. Perhaps there is more to her than people imagine… though soon her own life is under threat. 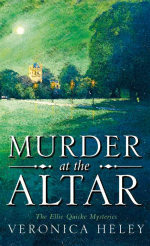 The first Ellie Quicke Mystery.